Locksmith is an important profession since a long period of time. The art of making and opening of locks is known as the art of locksmithing. This is also sometimes called security engineering. The technique behind the making of locks has not undergone much change since the medieval times. The main technique used is the pin tumbler method. This is one of the reasons why the position of locksmiths has not altered much with the passing of the years. With the growth of science and modern technology, there has been a metamorphosis in the system. Laser technology and digital technology is now used by the locksmith in the making of locks and keys. It is a natural progression from the traditional methods as the security engineer in modern world is more adept with computers and lasers and the digital systems than the traditional lock systems. In the earlier days, a locksmith would make the lock by himself. He would toil for hours at a stretch and then make a lock by using files and hammer. The lock producing methods have now changed. Some standard basic designs are used by companies for making the lock. They make the lock for each member different and unique by altering one part of the lock i.e. the pins, levers or wafers. The locksmith in modern times does more repairing jobs than manufacturing jobs. 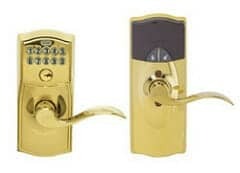 There are many locksmiths who work out of the commercial showrooms also. They may go around in their vehicles and provide mobile locksmith services in their local area. Most locksmiths are self employed individuals but some may be employed by a company as well. Locksmiths these days occasionally also work as security engineers. They design the entire home security and can install alarms, cctvs, shutters, intercoms and other security systems. The higher the degree and skilled a locksmith has, the higher the cost incurred by their company is likely to be. Technological innovations like digital locks have also hampered the job prospects of many locksmiths. Hence the locksmith in the modern times has shifted from being the guy who deals with making locks to a services provider who mainly provide services related to prevent security breaches and help people get back to their homes. This increases their scope of employment and helps them earn their living.